The Development Permit Survey, also known as a DP Survey, is typically the first survey required for your new project. The DP Survey is used by the architect or designer as the basis of their new home design, renovation, or infill construction project. Note: New developments, construction, or renovations on your property will require a Development Permit from the municipal authority. Its important to start the DP Survey process as early as possible to avoid delaying the start of your next project. The DP Survey includes alot of vital information which allows the architect to determine the lay of the subject lot, the neighbouring lots, and the surrounding area. 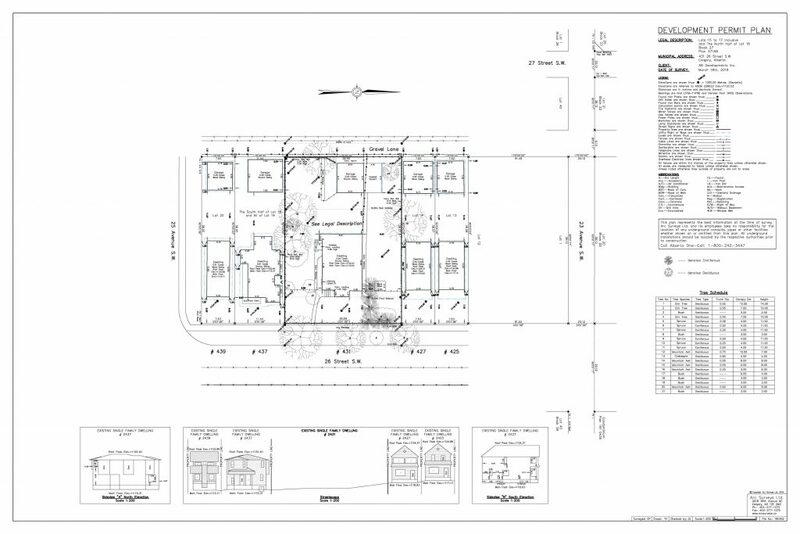 Information shown includes building dimensions and setbacks, block plan, streetscape, side views, trees, contours, geodetic elevations, and any other relevant information. Each project is different, and requirements can vary according to lot size, location, zoning, etc., therefore it’s best to work with us in cooperation with your local municipality and your architect to determine what information is required to be included on your Development Permit Survey. If you would like more information, or to inquire about your next construction survey, contact us here. We look forward to working with you on your next project.